Role: Volunteers work on achieving the goals set out in the Care Management Plan, including running educational games and group activities, and providing emotional support. 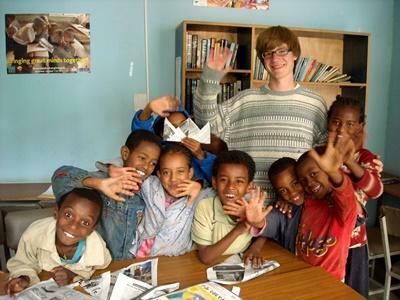 Ethiopia is a fascinating country in which to volunteer with disadvantaged children in Africa. Only two decades ago, Ethiopia was ravaged by massive famine and cruel conflicts that left many hundreds of thousands of children in disadvantaged circumstances. Today, the onslaught of HIV/AIDS combined with endemic poverty means that many children are left to fend for themselves. The need for volunteers cannot be over-emphasized. Despite the rapid growth of the capital, Addis Ababa, and the emergence of a small Ethiopian middle class, over three quarters of Ethiopians still live on less than $1 a day. A placement on one of our volunteer Care Projects is sure to be challenging but there will not be a single moment when you doubt that you are needed, or valued. You can experience volunteer development work on a Care placement in Ethiopia as part of a gap year in your education, a university summer vacation, on a career break, as part of an extended holiday or during your retirement. You could be a trained professional or totally new to the field. All we ask is that you have a passion for and a commitment to the work and to the people you are there to help. You can read more detailed information about the aims of the project in our Ethiopia Care Management Plan. Projects Abroad is based in Addis Ababa, Ethiopia's capital. Located in the centre of the country at an altitude of 2400m, Addis Ababa is the third highest capital city in the world. 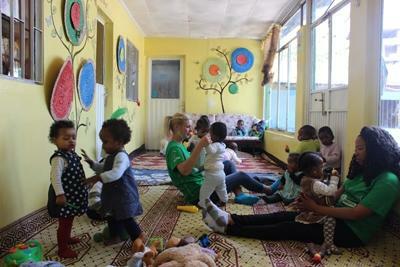 Care volunteers in Ethiopia work in day care centres, kindergartens and care centres in and around the capital. The centres provide care for children in need of support. The children will benefit from the emotional support that volunteers have the time and energy to give. This is where your help is most needed. Volunteers also organize occasional trips out from the care centres and sometimes assist with fundraising events. We also work with a local organization that arranges activities like games and sports for street children. These extra activities usually run a couple of times during the week and on Saturdays and all our volunteers in Ethiopia have the opportunity to be involved. Day care centres and kindergartens provide a safe haven where children can be free to play and learn away from the stresses of their home or street lives. Apart from fundamental childcare activities such as feeding and making sure all the children have suitable clothing and access to bathroom facilities, you will find yourself getting involved in other essential activities. Whether you are helping a child to learn to count, organizing a game of catch or letting a child braid your hair, volunteer work in Ethiopia will make a difference to the quality of their daily lives. Many placements will appreciate you providing an extra dimension to the children’s’ education by giving them some informal English lessons. With Ethiopia increasingly becoming a tourist destination for visitors from the developed world, this will be a valuable skill for young people trying to find jobs. 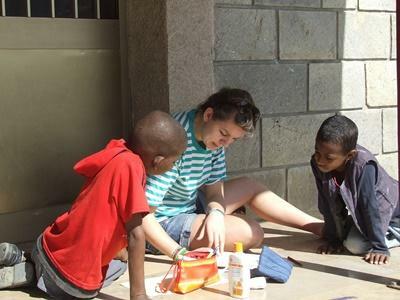 Over the years, our volunteers have worked with children at orphanages and residential care homes in Ethiopia. They have done incredible work at these placements, improving living conditions there and creating opportunities for children by supporting their education and care. However, we have decided to move our focus away from orphanages and homes toward community and family-based care. This is because we believe stable family environments are best for the children we work with. Read more about orphanage volunteering and our position on it. 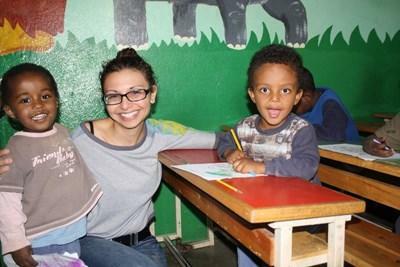 This means that instead of volunteering in orphanages in Ethiopia, volunteers will work in placements like day care centres, kindergartens and schools, or support groups for the elderly and mothers and babies. This will help Projects Abroad build stronger relationships with local communities and – most importantly – help families stay together and flourish. If you are a high school student and first-time traveller you may want to consider our High School Special programs in Ethiopia.